I’m a huge baseball fan and have made a point to visit many baseball stadiums during my travels. However, despite this, I’ve never actually had a chance to tour a stadium until recently when I toured PNC Park in Pittsburgh. 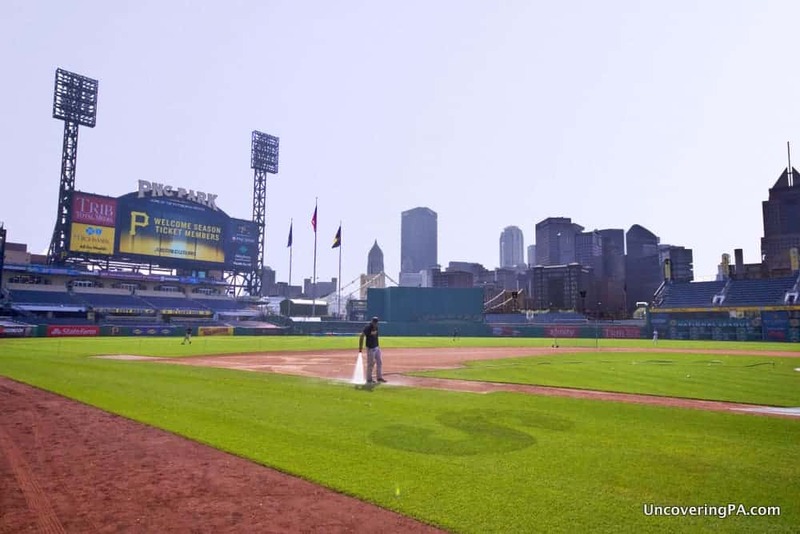 Home to the Pirates since 2001, PNC Park is consistently ranked as one of the best baseball stadiums in the country. In fact, I think it’s the best stadium in the US, and I’m not even a Pirates fan. So, when I found out that they offered tours, I excitedly jumped at the chance to visit. 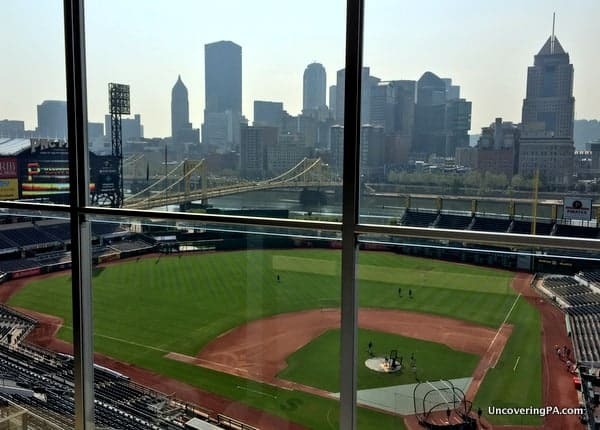 Private tours of PNC Park are available during the week and on select Saturdays during the baseball season, starting in mid-April and continuing until the Pirates finish their season, playoffs included. 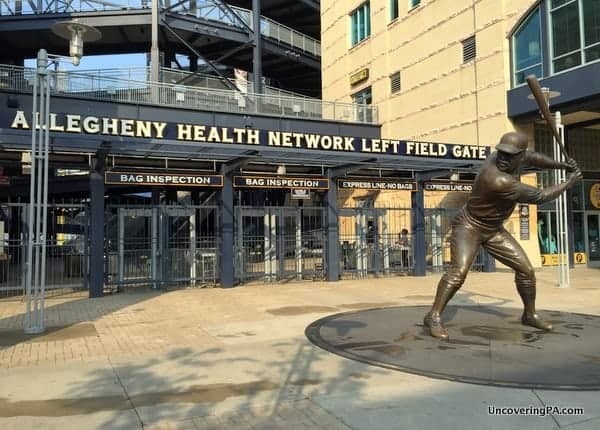 Tours leave from the stadium’s left field gate next to the Willie Stargell statue and last roughly 90 minutes. The PNC Park Tour starts from the stadium’s left field gate. My tour of the stadium started with a brief orientation and history of the ballpark while standing in the left field bleachers. My guide told me about the history of the Pirates organization and a few interesting tidbits about the stadium. For example, the lights of PNC Park were designed to look like those at Forbes Field, but were almost deemed too small for Major League Baseball standards. To combat these, lighting engineers were hired to precisely point each individual light to achieve acceptable lighting throughout the stadium. The first official stop on the tour is Legacy Theater and Museum. Here, I was told about the many great firsts in Pirates history (like how the Pirates owner invented the World Series). There are also actual lockers from Forbes Field, Three Rivers Stadium, and PNC Park on display here. Inside the Legends Theater you can see real lockers from the Pirates last three stadiums, including Three Rivers Stadium (left) and PNC Park (right). 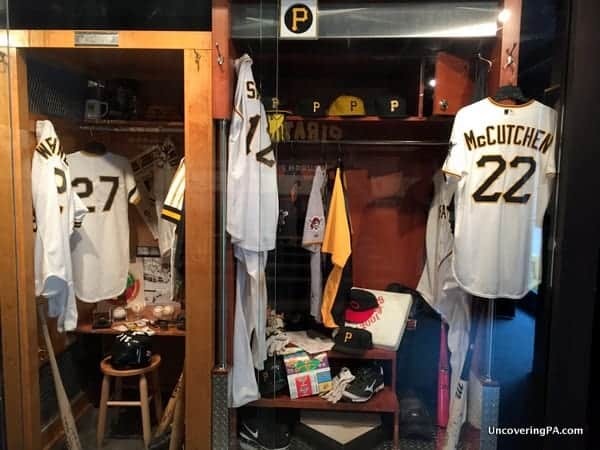 Should you be visiting on a day that the Pirates are in town or are traveling to/from Pittsburgh, you’ll be shown a video here of the Pirates clubhouse. However, if you visit in the middle of a road trip, you’ll actually be able to go into the clubhouse. While the video does show you a few places you can’t see on the tour, like the swimming pool, I’d recommend going on a day when you can actually walk into the clubhouse, as it’s an amazing experience. Unfortunately, cameras aren’t allowed in the clubhouse itself, but I was blown away to be standing there. Looking around the room, you can get a close up look at the lockers of the players. The lockers are full of each player’s personal items and uniforms. If you are a baseball fan, it really is quite amazing to see inside this area. 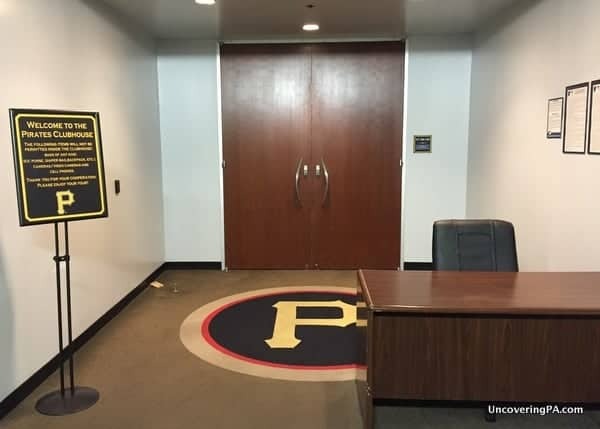 The entrance to the Pirates Clubhouse. You’ll have to visit to see what it looks like beyond these doors. While I was in the clubhouse, my guide explained each of the things that we saw. The wall is plastered with schedules, rules, and lineups. I also walked by the manager’s office and had a chance to peer into both the weight room and the training room. Unfortunately, this is the only part of the tour where no photos are allowed. The next stop on the tour is the batting cages. Here, it was explained to me the routine that players go through to get warm and how they use the variety of TV monitors and equipment to study their swings. From there, we went through the tunnels that the players would use to go from the clubhouse to the dugout. As a kid I dreamed of playing Major League Baseball, so to walk into a dugout and run up the steps and onto the field was really something of a dream come true. 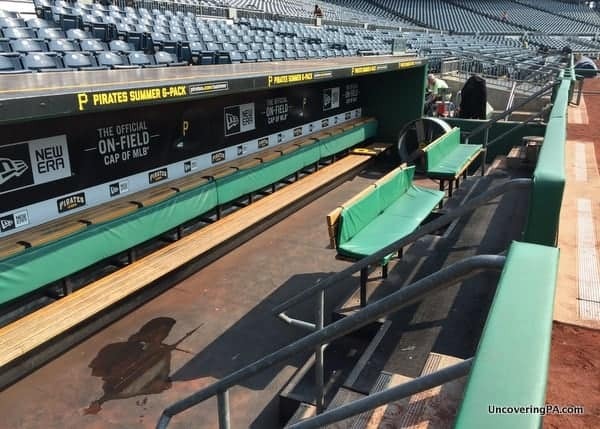 It was very cool to visit the Pirates dugout. While you are only allowed in the dugout and the dirt in front of it, it was fun to stand in these areas and see what the players see (though I had to imagine the thousands of cheering fans). While in this area, my guide explained various things in the dugout, as well as told me about the unique aspects of the Pirates’ grass and dirt. The fantastic view of PNC Park and downtown Pittsburgh from the Pirates dugout. The rest of the tour continued to the upper areas of the stadium, including the press box (but not the radio or TV booths, unfortunately) and the club and suite levels. All along the way, my guide was telling me a variety of interesting facts about the stadium and the team’s history. It’s amazing how much they have woven the team’s history into the stadium, and I’m sure even season ticket holders would learn something they didn’t know. The view writers see from the press box high above PNC Park. I really can’t express how much I enjoyed my tour of PNC Park. Even though I’m not a Pirates fan, I found the tour to be very interesting and it was a real treat to be able to see places like the clubhouse and the dugout. I would highly recommend a tour of PNC Park to any baseball lover, no matter which team you support. Note: My tour of PNC Park was provided courtesy of Visit Pittsburgh. However, the opinions expressed are my own. 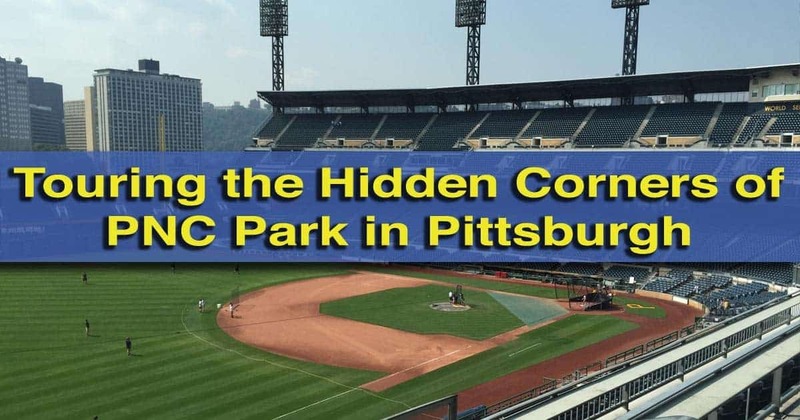 Want to explore more of Pittsburgh’s baseball history? Check out the Roberto Clemente Museum the remains of Forbes Field, or visit the graves of the Baseball Hall of Famers buried in Pittsburgh. Hours: Most weekdays and select weekends. See website as exact days and times very. Thanks! I’m not sure if I’ll be able to stay long enough in the morning to take the tour myself, but I may visit the grounds outside the park.